AIA decides to revoke Sabino Baseball state title, forfeit all games and be placed on a year of probation, starting Tuesday. It's an uncertain future for the Sabino High School Baseball program. Three months after the team captured the coveted 3-A state title, it's now being stripped of the championship. On Wednesday, Sept. 12, the district is taking its case to Phoenix before the AIA board to appeal its ruling. KGUN9 will cover the hearing. This follows TUSD's months long investigation into claims of illegal recruiting practices. "We are committed to doing everything we can to preserve that state title," said TUSD Superintendent Gabriel Trujillo. A statement made by the superintendent hours before the Arizona Interscholatic Association brought down the hammer on the Sabino Baseball program. The board pushed up its review of the alleged illegal recruiting case -- originally scheduled in September. The AIA asked the district to investigate a number of claims shortly after the team won the state title. 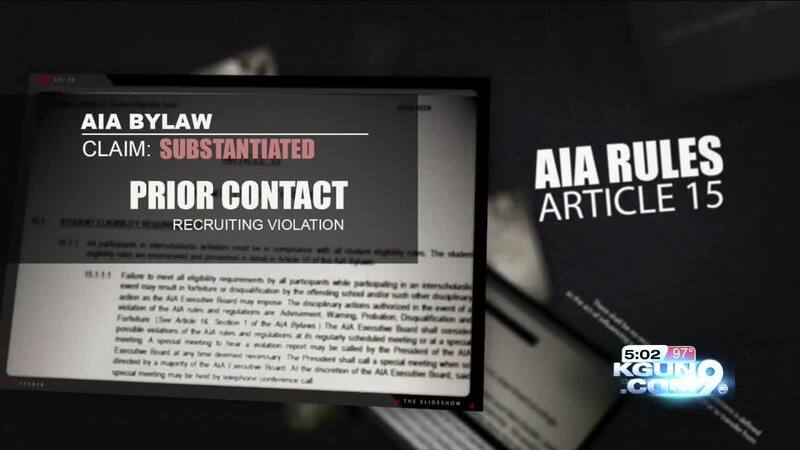 After months of interviewing coaches, staff, players and parents, the district found coaches violated 2 of 4 AIA bylaws -- misuse of booster club funds and coaches having prior contact with athletes -- a recruiting violation. Trujillo vowed to appeal all sanctions. "I never believe that a student athlete or a student in general should pay for a lack of oversight for part of the adults or the system or gaps in decision making with regard to the coaching staff," he said. The sanctions come a few days after two coaches -- Mark Chandler and Jason Falwell -- resigned in lieu of being released. And a few weeks after we reported head coach Chandler has a history of violating district and AIA rules. Trujillo will appear before the AIA board next month. "I'm going up to the AIA on Sept. 12 along with the principal Russ Doty," he said. Trujillo says he's sharpening his internal controls "to make sure that coaches at large -- not just at Sabino but around the district -- have a tighter and thorough knowledge of how to handle club accounts and booster monies." He added that the district will provide proper professional development on the issue of prior contact. Meantime, we're digging into a 5th claim of bullying and retaliation by coaches against at least one player on the team. At the media briefing, the superintendent did not mention a fifth claim -- until we did. "Yes, there was a 5th allegation. I will only acknowledge that that 5th allegation did involve an allegation of bullying. I will not be discussing whether or not it was sustained or substantiated nor the identity of the family or student involved," said Trujillo. The superintendent says the bullying and retaliation claims are district -- not an AIA -- issues. The parents gave KGUN a copy of a letter they received from the district yesterday. The letter reveals the district apologized for the unprofessional conduct of the coaches. Allegation #1: A student athlete who transferred to Sabino High School was recruited by a coach at Sabino in violation of AIA Bylaws. The district’s investigation did not substantiate this allegation. Allegation #2: Two student athletes who transferred to Sabino High School should have been ineligible to play for the entire 2018 baseball season under AIA’s “Prior Contact Rule.” The District’s investigation concluded that the students had prior contact with coaches from Sabino High School through a club baseball program. The District’s investigation found this allegation to be true. Allegation #3: Sabino High School arranged for compensation of one of its varsity baseball coaches from funds other than district funds in violation of AIA Bylaws. The District’s investigation concluded that an individual who had previously been a paid assistant coach was paid by booster club funds as an equipment manager but continued to perform as a “volunteer” coach. This allegation was found to be true. Allegation #4: Parents were pressured to have the students athletes play outside league baseball and participate in club baseball. The district’s investigation did not substantiate this allegation. Allegation #5: A Family made allegations that their student was bullied and subjected to retaliation. Due to Federal Privacy law (FERPA) the district will not publicly address this allegation. Following this investigation, the head coach of the Sabino Baseball team resigned. Tucson Unified School District has been informed that the Arizona Interscholastic Association executive board has ruled that Sabino baseball must relinquish the state title and that the program should be placed on probation. We have filed an immediate appeal and will appear before the AIA on September 12th for the appeal hearing requesting that the Sabino student athletes be held harmless from the mistakes made by the adults responsible for AIA bylaw compliance.